Let’s face it- some of the best products Econet has ever offered its subscribers are the Facebook and WhatsApp bundles. For a bargain price you have unlimited access to two of the most frequented, and probably essential applications for anyone exploring the virtues of a smartphone in Zimbabwe. Econet gets how social media is the fuel to the data consumption fire and they came up with something that has made image/video/audio file sharing so affordable. Social media has a significant Internet following in Zimbabwe with the WhatsApp message service accounting for almost a quarter of Econet’s Internet traffic. These have not been the only deals for social media access to be presented to the market lately. Telecel has its own Facebook Zero which has been getting mixed reactions from users. Free Facebook access (sans the images) is a good deal whichever way you want look at it though. Sadly there another side to easily accessible social media. It only takes so little for a damning video, or picture to go viral. A couple of days ago there was an article about a man called Madzibaba Chacha (not his real name apparently) who was pictured wearing a Zimbabwe Republic Police (ZRP) official uniform and got fined $100 after the courts found him guilty of criminal nuisance. 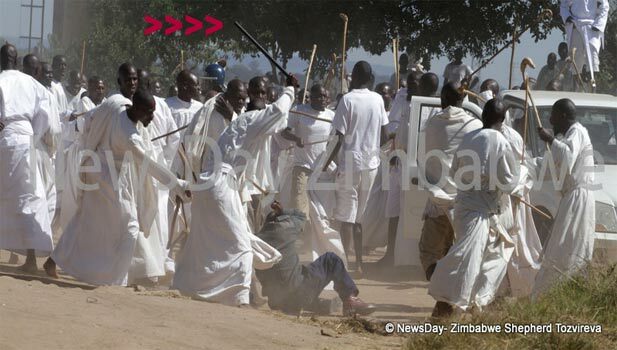 The picture which he posted on Facebook with the tag “If you can beat them, join them too” and circulated on WhatsApp was meant to be a humorous look at an incident where police officers and journalists were assaulted by members of Madzibaba Ishamea Mufani’s apostolic sect. The picture was cited as a mockery of the police force and while we all ended up getting our hands on the image from countless followers of the Budiriro incident ,for Chacha the joke cost him a suspended sentence. The Police/Apostolic encounter was also a classic depiction of viral digital media. For most people who did not get the chance to read the exclusive news release from Newsday on the day there was still enough talk about the incident on Twitter less than an hour after the incident. And lets not forget the images that were circulated on WhatsApp and more recently the humorous Zim dancehall tracks and videos inspired by the sad incident and pushed on the same social platforms. Another “victim ” of social media has been the (in)famous dancer Beverly Sibanda. Earlier this month she was arrested on charges of breaching the Censorship and Entertainment Control Act and violating terms of her dancing licence. The evidence in the case was a video of her dance moves went viral on social media. Social media has an ugly side as well when you consider how “intimate conversations” end up circulating and the controversy they stir up. Who can forget the graphic WhatsApp chats allegedly from Pastor Gumbura’s wives or more recently the WhatsApp conversation thread allegedly from Sungura superstar Alick Macheso’s now ex-wife. Thanks to social media a huge sensation followed both these stories and the public was given even more ammunition to draw conclusions on the characters of the people involved in each case. There’s always many ways to look at tech and how it disrupts our lives and judging from the way social media creates connections and stirs debate in our lives it has got a good, bad and ugly story to tell.